Dr.Malpani's Blog: IVF versus ICSI - which is better ? IVF versus ICSI - which is better ? Both IVF ( in vitro fertilisation) and ICSI ( intracytoplasmic sperm injection) are types of assisted reproductive techniques, but patients still get confused between the two. Which do we select and when and why ? The technique which was first developed was IVF . 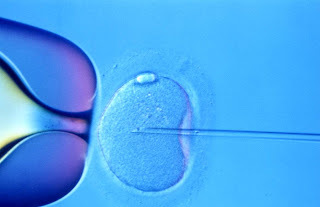 ICSI is a modification of the basic IVF technique. From the patient's point of view, everything remains the same, as regards superovulation, scans, monitoring, egg collection and embryo transfer. The only difference is what happens in the lab. In IVF, we allow the sperm to fertilise the eggs on their own. In ICSI, we give the sperm a piggy-back ride into the egg with the help of a micromanipulator. However, for men with normal sperm counts, is IVF better ? or is ICSI better ? What about the risk of injecting an abnormal sperm in ICSI ? Theoretically, some doctors believe that IVF will ensure that only the healthy " best" sperm will fertilise the egg, whereas with ICSI if the embryologist selects an abnormal sperm, the embryo will be abnormal. However, years of experiences with millions of ICSI cycles has proven this is not a valid concern in practise. It is important to emphasise that the risk of birth defects is not increased after ICSI. It is true that azoospermia men with Y chromosomal microdeletions who do ICSI will have sons who also have the same microdeletion. However, the children of men with normal chromosomes who are born after doing ICSI will also have normal chromosomes . The procedure of ICSI by itself will not cause genetic problems ! Even though the success rates with IVF are as good as with ICSI, we prefer doing ICSI in our clinic, even when the sperm are normal. This is for two reasons. In ICSI , we need to denude the oocytes before doing the ICSI. This allows us to assess the oocyte quality much more closely - and we think this is important for older women and women with poor ovarian reserve, because this allows us to assess egg quality. The other reason is that the major disadvantage of IVF over ICSI ( in men with normal sperm) is that in some patients for whom we do IVF, we will have total failure of fertilisation . This can be a big blow, because this is totally unexpected. Even though the sperm count and motility are completely normal, the sperm are not capable of fertilising the eggs, and we only find this out after doing IVF. If there are no embryos, then the chances of achieving a pregnancy are zero - and this means the patient has to start another fresh cycle, in which we have to do ICSI to ensure fertilisation. Doing ICSI for all patients routinely helps to prevent this heart-breaking problem. A great compendium of resources and information regarding the entire IVF process. This is really helpful to anyone wishing to enquire, or for a couple potentially nervous about embarking on the IVF journey. You cannot put a price on peace of mind, and this really puts any worries to rest, at least initially. IVF - making sense of the treatment cycle ! Doctor, what went wrong ? Does CAT help to improve IVF pregnancy rates ? Do all Indian infertile women have TB ? Games doctors play with HCG levels ! Is it all right for doctors to lie ?